Follow step-by-step instructions to field dressing that deer you just bagged! This card measures 3 7/8" x 5 7/8" and is printed directly on PVC with UV resistant inks. 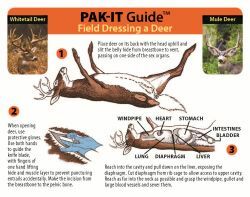 Follow step-by-step instructions to field dressing that deer you just bagged! This Field Dressing a Deer Ident-I-Card™ measures 3 7/8" x 5 7/8" and is printed directly on PVC with UV resistant inks to withstand weather and abuse and provide many years of service. On the front, full color images show detailed images and instructions to begin the field dressing process. On the back are additional images and instructions to prepare to take that deer home.